On one occasion the Blessed One(The Buddha) was staying near Rajagaha in the Bamboo Grove, the Squirrels' Sanctuary. Then the brahman Akkosaka Bharadvaja heard that a brahman of the Bharadvaja clan had gone forth from the home life into homelessness in the presence of the Blessed One. Angered & displeased, he went to the Blessed One and, on arrival, insulted & cursed him with rude, harsh words. When this was said, the Blessed One said to him: "What do you think, brahman: Do friends & colleagues, relatives & kinsmen come to you as guests?" "Yes, Master Gotama, sometimes friends & colleagues, relatives & kinsmen come to me as guests." "And what do you think: Do you serve them with staple & non-staple foods & delicacies?" "Yes, sometimes I serve them with staple & non-staple foods & delicacies." "Whoever returns insult to one who is insulting, returns taunts to one who is taunting, returns a berating to one who is berating, is said to be eating together, sharing company, with that person. But I am neither eating together nor sharing your company, brahman. It's all yours. It's all yours." "The king together with his court know this of Master Gotama — 'Gotama the contemplative is an arahant' — and yet still Master Gotama gets angry." When this was said, the brahman Akkosaka Bharadvaja said to the Blessed One, "Magnificent, Master Gotama! Magnificent! Just as if he were to place upright what was overturned, to reveal what was hidden, to show the way to one who was lost, or to carry a lamp into the dark so that those with eyes could see forms, in the same way has Master Gotama — through many lines of reasoning — made the Dhamma clear. I go to the Blessed One for refuge, to the Dhamma, & to the community of monks. Let me obtain the going forth in Master Gotama's presence, let me obtain admission." 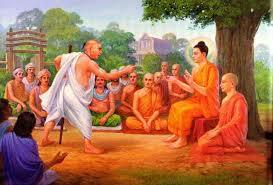 Then the brahman Akkosaka Bharadvaja received the going forth & the admission in the Blessed One's presence. And not long after his admission — dwelling alone, secluded, heedful, ardent, & resolute — he in no long time reached & remained in the supreme goal of the holy life, for which clansmen rightly go forth from home into homelessness, knowing & realizing it for himself in the here & now. He knew: "Birth is ended, the holy life fulfilled, the task done. There is nothing further for the sake of this world." And so Ven. Bharadvaja became another one of the arahants. 2. Akkosaka thinks that the Buddha is cursing him — and thus angry — when actually the Buddha is simply stating a fact in line with the law of kamma.